Writers can believe that as word-based creatures we have it signed and sealed with lots of text-based research and outlining – from thought to page. But as a visual learner, I personally get a lot from implementing visual project gathering, and browsing such creations for inspiration. Designers have various terms for these visual project boards – moodboards, visual boards, project boards. Web and mobile apps let us put together curated content and display on project boards digitally. Note: this is a long post, designed for browsing. Split into two pages, you’ll find content curation on the first, and project mood board apps on the second. Following is a list of the most helpful apps I’ve found for content curation of visual elements. There’s no surprise to this one. 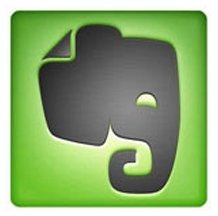 Evernote is my own go-to app for note-taking (via many third party apps) and full-on data storage on the cloud. Evernote’s Web Clipping functions, Clearly browser extension and Skitch annotation functions mean I can easily collate full webpages or images from the web – including the URLs to the originals. 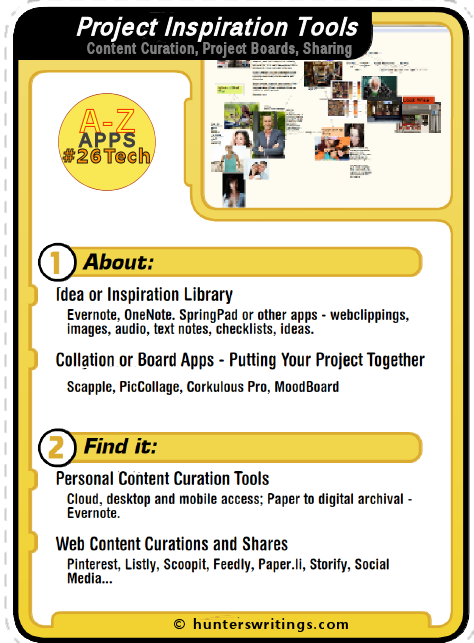 For more on Webclipping see the E post in this #26Tech series. Evernote has various visual methods for displaying notes inside the apps – you can view by list, snippet or card. The image shot above was taken from a post I published last Christmas, showing my Christmas gift wish list notebook in card view. If you want alternatives to Evernote, I profile Springpad and MS OneNote in the N post for this series. 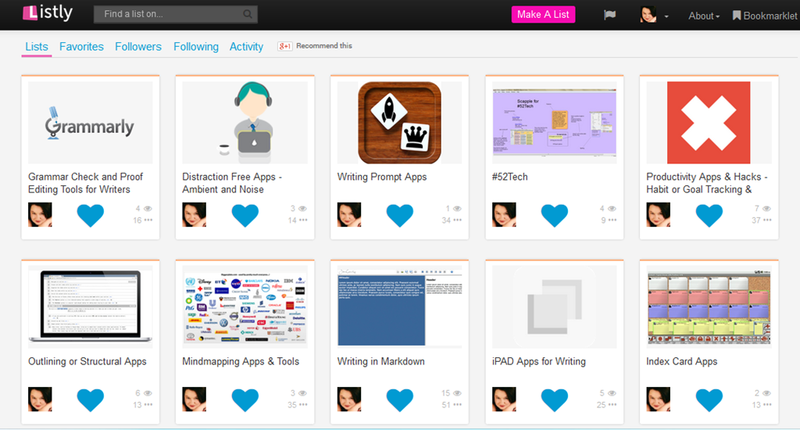 Springpad, in particular, allows for a very visual environment and nice webclipping image curation. For full visual image curation, nothing can beat Pinterest, where my own boards have found over 1000 followers. Supported by browser bookmarks and Pinterest mobile apps. The social media pinning website lets you curate images from all across the web or follow other Pinterest users who may be collecting images you are interested in also. Although I keep some popular writing-related boards, I also use Pinterest to hold private board content for projects I’ve just begun working on, and for curating images that inspire my stories – for instance there’s a book board containing sample maps of locations, character profile headshots and the like. Pinterest is huge, and free. I’ve only recently discovered Listly, so am slowly building my own lists of resources – for me these are mainly apps, and my lists support these #26Tech posts also. Listly signup is free. Pro users get access to more editorial functions for lists. Free users have the ability to brand their lists with a header image also. Supported with browser bookmarklets, there is no mobile version, but Listly lists look good in most mobile browsers anyway. Grid is a free app by Binary Thumb, designed as a place to contain your projects and plans on the iPAD. As the app title suggests, items are displayed in a grid design. Grid items can be images, text or contacts or places, arranged as you like. However, there doesn’t appear many sharing options, or the ability to export a grid as PDF or online. Scoop.it! – a free social media webapp that works with bookmarklets again. Find content on the web, and share on a Scoop.it page to create a stream of news on a topic. Works with Twitter, Linkedin, Facebook and Google+ content, backwards and forwards. Storify – combines Scoop.it with Paper.li – you can collect media from across the web, and publish it to a story. The story can be embedded into websites, or shared via social media. Webapp and mobile apps to support. Paper.li – creates paged newsletters from your own Facebook, Google+, Twitter, Tumblr or RSS streams and topic selections. Can post the link to the daily paper online, or publish via email links or onto your social media streams. Feedly – Feedly took over as feed-reader for many people when Google Reader wound up. The service provides a clean customisable experience with inbuilt sharing for all your RSS feeds. There is a webapp and mobile apps, a free and premium service. I use the free service on a daily basis, allowing me to send any posts I like through to Twitter or Facebook, or save for later reading into Pocket (where the posts can later be archived through to Evernote). 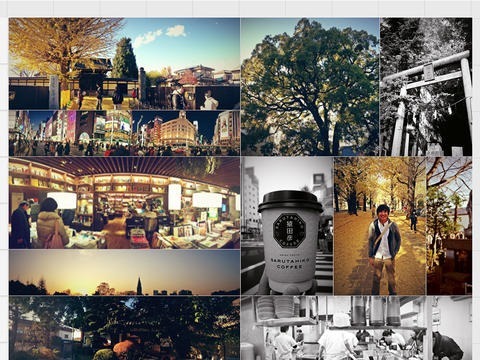 Nextpage: Project Mood Board Apps. Thanks for another great post full of ideas to support a writer through a first draft. Which in currently now doing again!